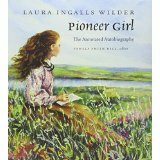 If I had to choose the author whose works entranced me most as a child, it would be Laura Ingalls Wilder. My fascination with Laura began in the fourth grade, when I was introduced to Little House In The Big Woods. This book was clearly intended to teach us kids who were living cushy suburban lives what it was like to grow up in a pioneer family. The books, and the seven that followed it, were all about survival and self-sufficiency in places where civilization as we know it had not yet penetrated. The Ingalls family saga began in the Big Woods of Wisconsin, where they had to eke out a living from hunting and raising crops on small patches of cleared land among the trees, all the while fighting off bears and panthers who roamed the woods freely. When Laura was about four, the family moved on to Indian territory in what is now Kansas, in search of more fertile land. Non-Indian settlement there wasn’t strickly legal yet, according to the Federal government, and both the Feds and the natives took steps to get rid of the interlopers. Then on to Minnesota, where marauding grasshoppers destroyed the family’s crops. Tragedy struck when Laura’s older sister Mary was struck blind as the result of an illness that could not be pinpointed at the time. Although expensive doctors were called in and the bills piled up, nothing could be done for her. When the Ingalls family moved to Dakota Territory, their final stop, they lived and worked for a while in a railroad camp, where Laura’s father Charles was the paymaster. He was threatened with beatings or worse when the pay was late. Even once the family settled on its own homestead, they dealt with one crisis after another. The weather alone could be a backbreaker. The legendary winter of 1880-81 merited a book of its own (The Long Winter). Summer tornadoes often proved just as destructive. I didn’t realize as a child that these books were fiction. It was easy to assume that they were literal truth because their level of detail is so vivid. That is why the recent publication of Pioneer Girl: The Annotated Autobiography, edited by Pamela Smith Hill, is so intriguing. It features the original memoir that Laura wrote prior to beginning work on her series, including all her misspellings and grammatical errors, and sometimes lapses of memory. Numerous footnotes are included that explain the actual history that inspired the series, and help to separate truth from fiction. Laura was assisted by her daughter, Rose Wilder Lane, in shaping the fictional works. Lane was an established author who had written several biographies that crossed the line between fact and fiction, angering some of her subjects. She advised her mother to use similar techniques, but without the pretense that they were straight autobiography. To make the novels more dramatic, yet suitable for children, they altered certain events, created some new and composite characters, and glossed over or excluded some of the family’s grimmest experiences. For example, the family’s sojourn in Burr Oak, Iowa, where they helped to run a hotel, was not included in the series. Presumably their proximity to a saloon, where Laura observed drunkeness and other questionable behavior when not yet a teenager, made it unsuitable for young readers. The death of Laura’s baby brother around this time was also deemed too dark an episode to deal with. Reading the “true story” has made me aware of a more important omission that, in my opinion, prevents the books from telling the entire truth. Although the themes of self-sufficiency and resilience were genuine enough, they sidestep the fact that there were times when the family needed help from the various governments under which they lived. During their Minnesota sojourn, after the grasshoppers wiped them out, Charles Ingalls was forced to apply for assistance to feed his family. Later in Dakota Territory, after blackbirds had destroyed their corn crop, it appeared that the family’s long-cherished plan to send Mary to a college for the blind in Iowa might be finished. The fictional version of the story dramatizes Charles Ingalls’s decision to sell his heifer calf to raise the necessary funds. This would be a considerable sacrifice, setting him back at least a year in establishing his farm as a fully functioning entity. The true story, however, is that Mary participated in a program established by the Dakota territorial government to educate blind students for five years at the nearest suitable institution. In our current polarized political climate, there seems to be scant middle ground between those who believe government is an evil force that makes people too dependent, and those who believe government can solve every problem. The moderate voices that ought to be heard are being shouted down by the loudest, rudest voices. I still love Laura and her adventures as much as I ever did. The Ingalls family indeed persevered through many trials and demonstrated great strength of character. But it would have been no shame to admit that from time to time, they and other pioneers needed the sort of helping hand that government programs could provide.